Connect to the Deepest of Yourself ! Subscribing allows you to get information and updates. Your email address will be kept confidential. Do you want to begin or go deeper into the experience of Yoga ? Do you have therapeutics issues or enjoy and restore your body’s energy system ? Do you want to center your mind and reconnect to your energy, and understand the relation to physical, mental and emotional body ? How meditation impacts your body and your mind? I founded in 2009 the DEVIN SCHOOL of Yoga in Basel – a community hub dedicated to all who wish to live a fuller, happier and healthier life. The essence of all yoga classes are the unique combination of the alignment of the body, mind and heart centre and the underlying philosophy. This is based on the advanced knowledge of biomechanics, thus making the practice for each, not only more accessible but also very safe. 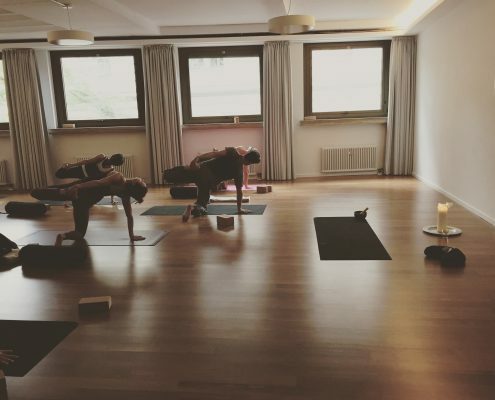 BASEL – A place for treatment of Osteo Thai, Yoga Therapeutics, Breathing and concentration courses. Treatments are certified ASCA – Reimbursement possible via the alternative medicine insurance – Please clarify with your insurance. Enfold your Practice in private or group class – Engaging in your health care requires three essential qualities: discipline, accountability and discernment. In the yoga classes the students learn and practice asanas (postures) accompanied by Pranayama (breathing exercises) and meditation, as an expression of the inner qualities of being, by connecting us with the heart. OsteoThai Yoga Massage is a truly wonderful experience for both giver and receiver as energy blockages are released, boundaries dissolve and deep healing occurs in a space of presence and meditation. In a unique way, Thai massage blends elements of acupressure, Yoga, reflexology, physiotherapy, meditation, energy healing, osteophaty and Ayurveda. Reconnect your Body and your Mind. By using ancient technics, recover the use of your senses by movement, touch, breath, technics of observation and concentration. How meditation impacts your body and mind awareness! Body-Breath-Mind is designed as a practice of centering your mind, understanding of your own body, related to physical, mental and emotional body. The retreats offer a place of inner peace and energy, exploring and deepening own Yoga practice. Immerse into guided Meditations, Pranayama practice for your spiritual growth. Discovering your True Nature! No previous art or yoga background is required. All levels are welcome, and participation is voluntary to create a community. 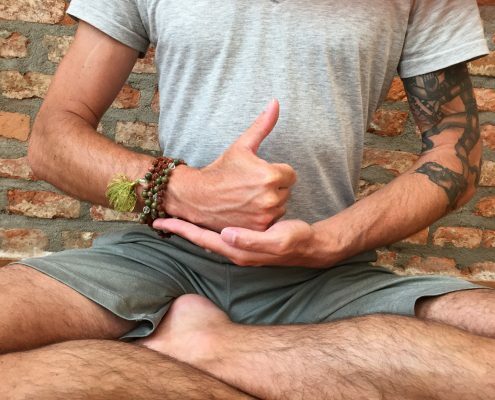 Vincent Pezet is teaching the yoga classes and meditation in English and German, and he also offers during the retreats different personalized yoga session or OsteoThai Yoga massage.